Mr. Duarte was originally hired by a Los Angeles based general contracting firm in the early 1990’s. There he started working part-time as a field laborer, helping with daily clean up efforts and maintaining job sites in high profile office buildings. After a while, he gradually made his way in helping their office operations with data entry and bookkeeping duties. As a result, Mr. Duarte also became familiar with assisting estimators and project managers in obtaining pricing information from subcontractors. After a few years, he worked his way up to become Chief Estimator for the firm. 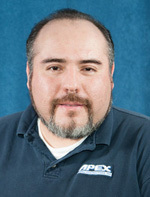 In mid 2002, Mr. Duarte left the LA firm and was hired by Apex General Contractors, Inc. During his tenure with Apex, he has successfully earned and built client relations, while still performing his estimating duties. With over seventeen years of construction experience, Mr. Duarte has worked with Architects and Building Owners towards achieving a common goal; to deliver the project on time and within budget.